For the fourth straight year, a Purdue Executive MBA Programs' alum -- this time, two -- makes Poets & Quants' annual list of the Best & Brightest EMBA students. Saskia de Bruin-van Dijk, Purdue IMM Global EMBA Class of 2017, and Lucy Houchin, Purdue EMBA Class of 2018, are among those alums from 45 top EMBA programs selected for "class contributions, academic performance, extracurricular involvement, professional achievement, personal intangibles and unique personal stories." Saskia is from Riethoven, Netherlands, and is currently Business Program Manager Europe for Lekkerland AG & Co. Working at the company's Cologne, Germany, headquarters, she says a professional achievement she is most proud of is starting "my career as a data entry clerk, now in a position as direct report to the CEO." "Saskia consistently worked ahead on courses during each pre-residency period, and as a result, she always came more than prepared to every residency," said IMM Program Manager and Associate Director John Lewandowski. "Her academic dedication paid off, as she maintained one of the highest grade point averages in her class. As a result of her academic efforts, Saskia accepted an invitation to join the prestigious Beta Gamma Sigma Society, the international business honor society for AASCB accredited schools." 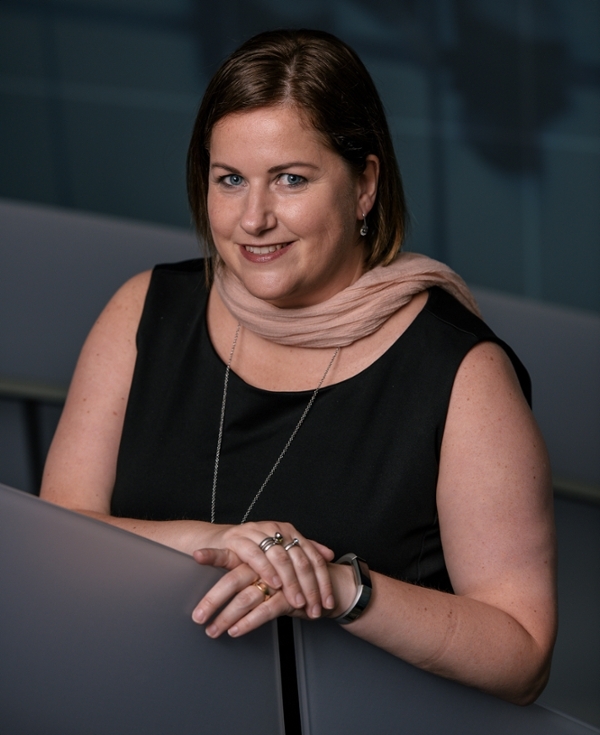 A native of Indiana, Lucy made a major move during her EMBA program, to the U.K., where she is Managing Director of IDI Composites International – U.K.
"The blended online and on-campus format of the Purdue EMBA program allowed her to continue her coursework without missing a beat," said Purdue EMBA Senior Program Manager Donna Steele. "During our first module, she was the top student in quantitative analysis and organizational behavior. It is a rare for a student to do so well in such different topics." We congratulate our Best & Brightest! Read more about this Poets & Quants series. Our Executive MBA programs are two of the top 50 Executive MBA programs in the world, according to The Economist’s Which MBA? 2018 ranking, and is one of only four schools to have multiple programs featured on the list. The Purdue Executive MBA program is ranked #47 in the world, and the Purdue IMM Global EMBA Program is #42, up from #51 in the publication’s previous ranking (2015). Krannert’s programs scored highest at Gender Balance (#3, IMM program); percentage increase on pre-EMBA salary after two years (#11, IMM program); and managerial work experience (#17, Purdue EMBA). The Economist ranked 65 EMBA programs. Programs had to be part-time and at least 50% campus-based. The ranking is based on personal development and educational experience, which measures quality of students and faculty and programs, along with student diversity, and career development, which measures career progression, salary and networking. The Economist surveyed recent graduates of each program. The percentage of Purdue EMBA students who have been promoted or grown their own company since graduation was 80 percent, with the IMM Global EMBA student rate at 73 percent. Both programs showed high return on investment: IMM Global EMBA students saw better than a 44 percent increase on their pre-EMBA salary after one year, with Purdue EMBA graduates seeing close to a 31 percent increase after a year. See the Economist's 2018 rankings and read about their methodology. See more Purdue EMBA Programs' rankings. 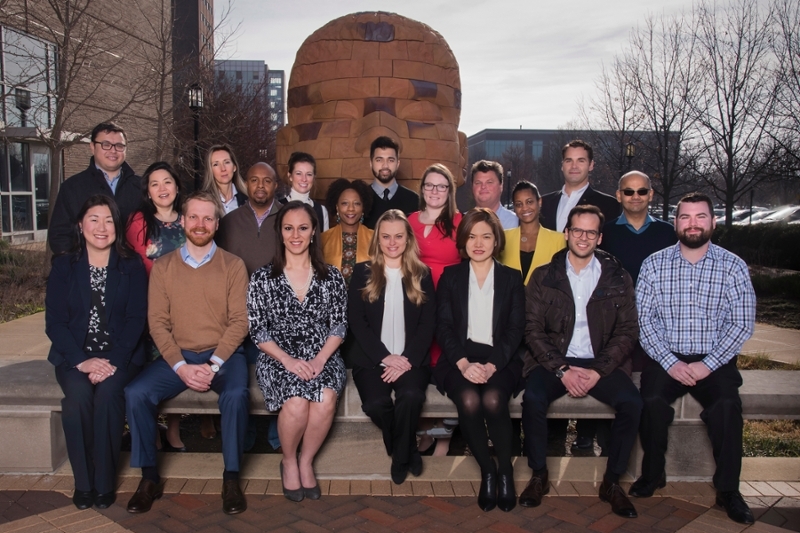 In March 2018, Purdue Executive MBA Programs welcomed the 21 accomplished professionals in the IMM Global EMBA Class of 2019 to their Launch Week. This on-campus orientation is always an exciting start to a new phase of our students' professional and educational lives. Representing countries from Nigeria to Saudi Arabia to the U.K., our newest Boilermakers will study in seven countries on four continents over the next 19 months. As our goal is to continuously improve the IMM program, this cohort will be the first to study with several new professors and take new courses, including Strategic Foresighting & Instinctual Design. Learn more about IMM 2019 in the cohort's class profile. Purdue's IMM 2018 cohort has become the first to study at Politecnico di Milano (MIP), the newest IMM program partner. In Spring 2017, the MIP Graduate School of Business joined the IMM program as a partner school. Politecnico di Milano is the most outstanding technical university in Italy. IMM 2018 spent the first week of their two-week Module 3 residency at MIP in Milan, Italy, where they took courses in Mergers & Acquisitions & Corporate Development and Operations Management; visited Mantero Seta, a family business that is a leader in the creation, production and distribution of wearable textiles; heard from the President and CEO of BMW Group Italia; drank some Prosecco; and ate pizza alongside Lake Como. The cohort travels to Vilnius, Lithuania, for the second and final week of their residency. 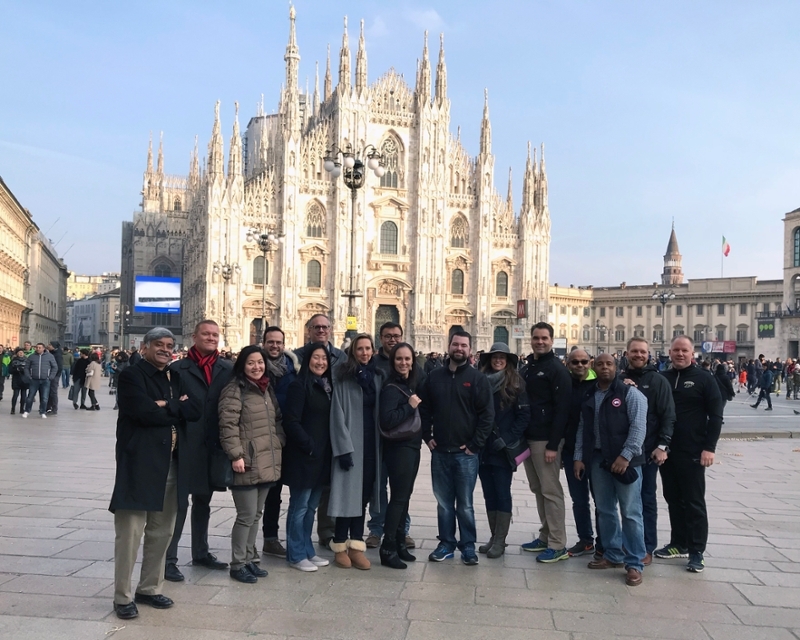 Purdue IMM Global EMBA students study in seven countries on four continents during their 19-month program, making IMM the world's most global Executive MBA program. 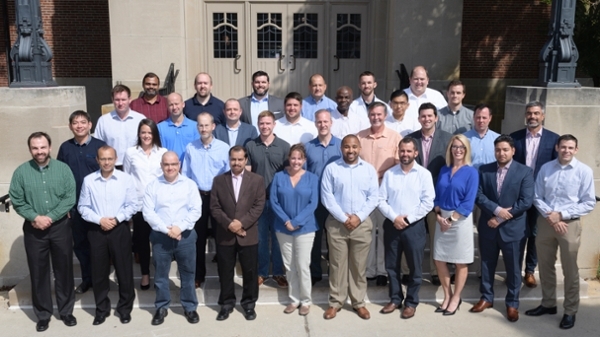 Introducing the Purdue EMBA Class of 2019! Among this group of professionals: an FAA-certified drone pilot; a certified yoga instructor; a Formula Mazda race car driver; and a Grammy winner. 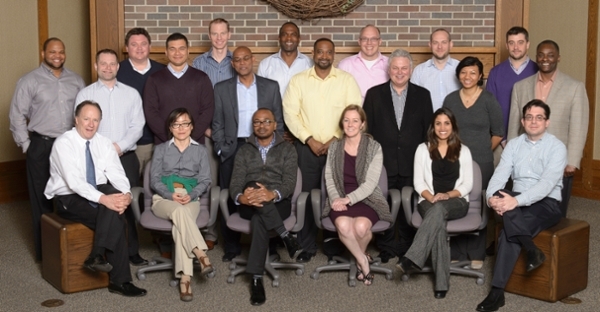 Purdue University EMBA Programs welcomed our newest cohort in September. The group has 15 years' average work experience and boosts employees of BP, Cummins, Fiat-Chrysler, Gogo, Pepsico, State Farm and more. 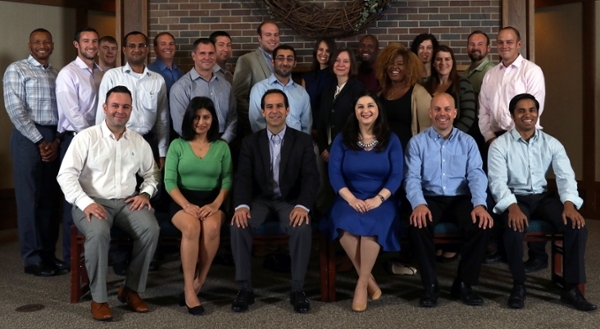 Find a class profile of our EMBA Class of 2019 here. We look forward to the next 19 months -- and beyond -- with our newest Boilermakers. The Purdue EMBA program launches each September. The 19-month program is organized into six modules, with five residencies at Purdue's West Lafayette campus and one international residency. The Module 6 international residency is at a location selected by the class, in consultation with Krannert Executive Education Programs staff. Recent 2-week residencies have been in Shanghai and Beijing, China; Rome, Italy and Istanbul, Turkey; and in three locations: Istanbul, Brussels, Belgium, and The Hague, The Netherlands. 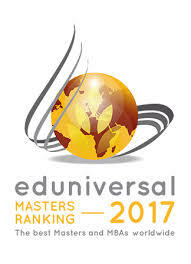 In its 2017 Best Masters rankings, Eduniversal named the Purdue IMM Global EMBA program #10 in North America. IMM was ranked #11 in 2016. Eduniversal's rankings are based largely on student surveys and employment information. Read about Eduniversal's methodology and see the full list of ranked Executive MBA & MBA part time programs in North America. Please note that when the IMM program was first created, it awarded graduates an International Master's in Management degree -- hence the acronym "IMM." The program has evolved and now awards an international Master in Business Administration degree. We decided to keep the recognizable IMM program name. 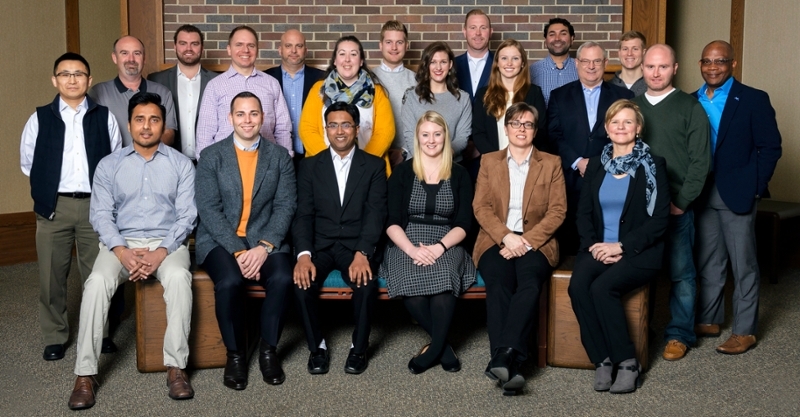 In March, Purdue EMBA Programs welcomed the IMM Global EMBA Class of 2018. What a great launch week, and what a great group! Among this group of Boilermakers is a skydiver; the former chief actuary for the country of Colombia; an Iron Man; a "traditional Bavarian boy" known for wearing Lederhosen; and a female West Point graduate among the first few thousand women to finish that military academy. Companies represented by the cohort include Accenture, Baker Hughes, Cummins, Dell, Rolls-Royce, and Witekio. Students travel for residencies from their homes in Brazil, Canada, Colombia, Germany, Hungary, The Netherlands, and more locations. Also exceptional about this cohort: It is 50% female. EMBA programs are typically 25-29% female. We look forward to the next 19 months -- and beyond -- with this wonderful cohort! 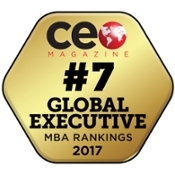 In its 2017 Global Executive MBA program rankings, released April 5, CEO Magazine named Purdue's IMM Global EMBA program #7 in the world and the Purdue EMBA #12.Both programs were placed in the magazine's Tier One category. The magazine ranked 290 MBA, Executive MBA and online MBA programs. CEO Magazine noted, "Using a ranking system entirely geared and weighted to fact-based criteria, CEO Magazine aims to cut through the noise and provide potential students with a performance benchmark for those schools under review." The magazine launched its annual rankings in 2012. See the full 2017 rankings here. Ivy Exec, a "curated community" of excutives and professionals, has released a ranking of EMBA programs based on a quantitative survey-based perception study with help from its members. Ivy Exec's 2017 rankings place the Purdue EMBA Program in the top five Executive MBA programs in the Midwest, with Kellogg, Chicago Booth, Ross, and Notre Dame. The rankings reflect the survey answers of about 5,200 study participants globally. Read more in this Newswire.com report. The Ivy Exec ranking also placed Purdue's EMBA program at #1 for Life Balance. "Balancing one’s personal life, career, and academic pursuits is a critical challenge for all EMBA students," Aldas Kriauciunas, Executive Director, Purdue University EMBA Programs, said. "Ivy Exec’s comprehensive rankings do prospective students justice by including data on Life Balance." Also in the list of the top EMBA programs in the region is the Purdue IMM Global EMBA program, named #8 overall and #4 for Global Experience. The January 2017 edition of our newsletter, The Purdue Executive, features alumni resources -- including details on an upcoming continuing education webinar -- a feature on a new research publication, Krannert Journal; a profile of our newest EMBA class; alumni success stories; and more. Our newsletter is published twice a year and is for alumni, current students, faculty, staff, and friends of Krannert Executive Education Programs. Alumni: Don't miss being included in the next edition's Alumni Notes! Send your news to The Purdue Executive editor Nicole Brooks at brook113@purdue.edu. The world’s most global Executive MBA program travels to Vilnius, Lithuania, for the first time in February 2017, to study at ISM University of Management and Economics. The IMM Global EMBA Class of 2017 will be in residency there February 13-18, and the students will immerse themselves in Lithuanian culture in addition to attending classes. During the IMM program’s one-week residency at ISM -- following a weeklong residency in Budapest, Hungary at IMM partner school CEU -- students will study Negotiations in Organizations, taught by Purdue’s Associate Dean for Executive Education and Global Programs Dr. David Schoorman, and Managing During Transition and Uncertainty, taught by ISM faculty. The cohort will be exposed to Lithuanian culture and business practices by meeting with government officials, touring Old Town Vilnius, Trakai Castle and others areas, visiting companies and witnessing Independence Day events. Vilnius, Lithuania, is the country's capital and largest city. "Lithuania's unique location and history sets the foundation for the Managing During Transition and Uncertainty course," said Purdue EMBA Programs' Executive Director, Dr. Aldas Kriauciunas. "The course is not just about Lithuania, but rather, uses Lithuania as a context for understanding a broader set of challenges and successes." Students in Purdue's IMM Global EMBA program study in seven countries on four continents in 19 months, and earn two MBA degrees. IMM students have traveled to and studied in Tilburg and Utrecht, The Netherlands; Rio de Janeiro, Brazil, and Santiago, Chile; Budapest, Hungary, and Istanbul, Turkey; West Lafayette, Indiana, U.S.; and Beijing, Shanghai, and Tianjin, China. In September 2016 we welcomed our EMBA Class of 2018. 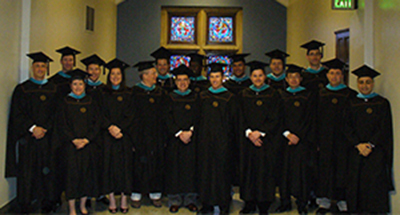 This group of 32 accomplished professionals includes graduates of our Technical Management Institute and Veterinary Practice Management Program; a U.S. Navy submarine officer; three Purdue University employees (Boiler Up! ); and employees of AAA, Alcoa, Amazon, John Deere, Nestle, PricewaterhouseCoopers, the USDA Forest Service, Whirlpool and more. Purdue's Executive MBA Class of 2018, in front of the Union during launch week. They come from 12 U.S. states and have an average 14 years of work experience. We look forward to a challenging, life-changing 19 months with this amazing cohort. What makes a great Executive MBA resume? Applying to an Executive MBA program? Perhaps your resume is not application-ready. Learn from Purdue EMBA Programs' Executive Director, Dr. Aldas Kriauciunas, and Associate Director of Admissions, Nancy Smigiel, how to spiff up that resume by clicking here. We're always looking to better understand the ups and downs of the economy and its long-term impact on business. But sometimes our 'crystal ball' is a bit murky, or worse yet, MIA. But what if the tools to assess the vagaries of the economy and what they mean for your business have been available all along? 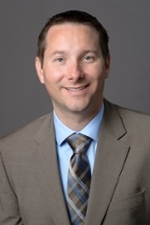 In the latest installment of Purdue EMBA Programs' Continuing Education Webinar Series, Krannert Associate Professor of Economics Kevin Mumford shows us how to utilize national wealth accounting to better analyze and forecast in the overall economic environment. Watch the archived online class to take away tools to evaluate the underlying productive base of an economy, and gauge the sustainability of economic trends and the implications for their business. Evidence of our commitment to lifelong learning, our Continuing Education Webinar Series provides biannual live webinars, in winter and summer, on a variety of topics. Check out the new edition of our biannual program newsletter, The Purdue Executive, which features alumni success stories; a spotlight on the stellar Jennifer Harms, IMM 2015; photos of our residencies; observations on the business-lawyer relationship by Indiana Court of Appeals Judge James Kirsch; and more. Also in the newsletter find a full calendar of our events and details on ways to engage with Krannert Executive Education Programs, from attending an on-campus open house to meeting one-on-one with a senior member of the team. 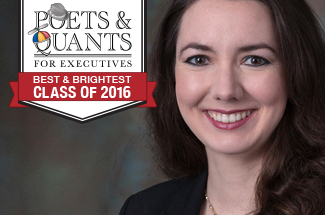 Jennifer Harms, IMM Global EMBA Class of 2015, has been named a "Best and Brightest" Executive MBA student by Poets & Quants. "I cannot emphasize enough how much I enjoyed the international component of Purdue’s IMM program," Harms told Poets & Quants. She graduated from the IMM program with two MBA degrees, one from Purdue and one from IMM partner school TIAS School for Business and Society, Tilburg University, in The Netherlands. Harms finished with the highest GPA in her cohort. Purdue EMBA Programs' annual networking event, held Thursday, May 5, 2016, showcased the Internet of Things. 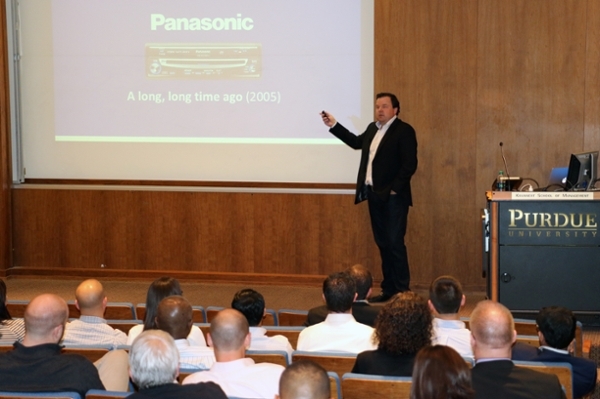 We welcomed Krannert alumnus John Annakin as our guest speaker in the Krannert Auditorium. Formerly the Executive Vice President of Sales and Business Development at CloudOne Corporation, Annakin was named Chief Revenue Officer of the Fishers, Ind.-based IT company just days before his presentation at Krannert. Our reception, following Annakin's talk and Q&A, brought together current Executive MBA students, Krannert Executive Education Programs alumni, and corporate guests from Amazon, Dow Agro, GE, and Oerlikon-Fairfield, among other companies. Always held the first week of May, our annual networking event intends to bring together corporate partners from surrounding communities, our alumni, and current students from all of our cohorts. View Annakin's presentation on the Business of IOT. CRO of CloudOne, John Annakin, gives a presentation in Krannert Auditorium as part of Purdue EMBA Programs' annual networking event. 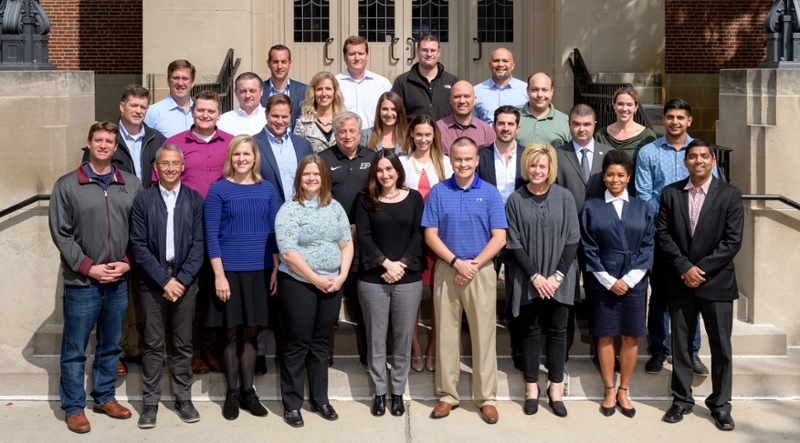 In March 2016, Purdue EMBA Programs welcomed the newest IMM cohort, the Class of 2017, to campus for launch week. These distinguished executive students come from seven countries and from companies including Boeing, Caterpillar, Cummins, Lekkerland Nederland BV, ThyssenKrupp Elevator, the University of Notre Dame and the Van Gogh Museum in Amsterdam, The Netherlands. Also noteworthy is the gender makeup of IMM 2017. The cohort is 52% female, an unprecedented achievement in Purdue’s EMBA programs and in many EMBA programs worldwide. IMM 2017 outside Krannert Center on Purdue's campus in West Lafayette, IN, during launch week. We look forward to an exciting 19 months with IMM 2017 as they travel to and study in seven countries on four continents. Read more about this special cohort in Krannert Magazine. 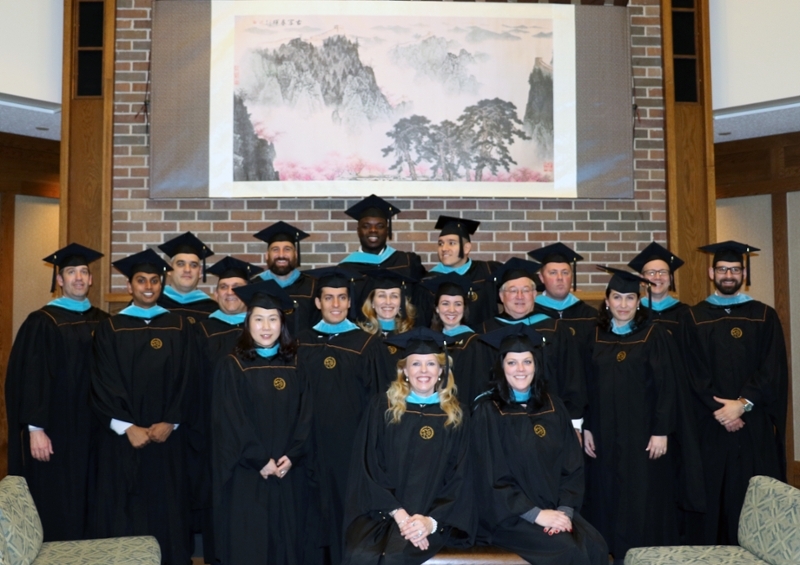 The weekend of December 19-20, 2015, 18 members of the IMM Class of 2015 returned to Purdue with their loved ones to celebrate the completion of their EMBA program. Below, the happy graduates pose under their class gift, a tapestry from China that now graces Krannert Center’s Weiler Lounge. The IMM 2015 cohort had students from China, Hungary, Nigeria, Peru, South Africa, Taiwan, and eight U.S. states. 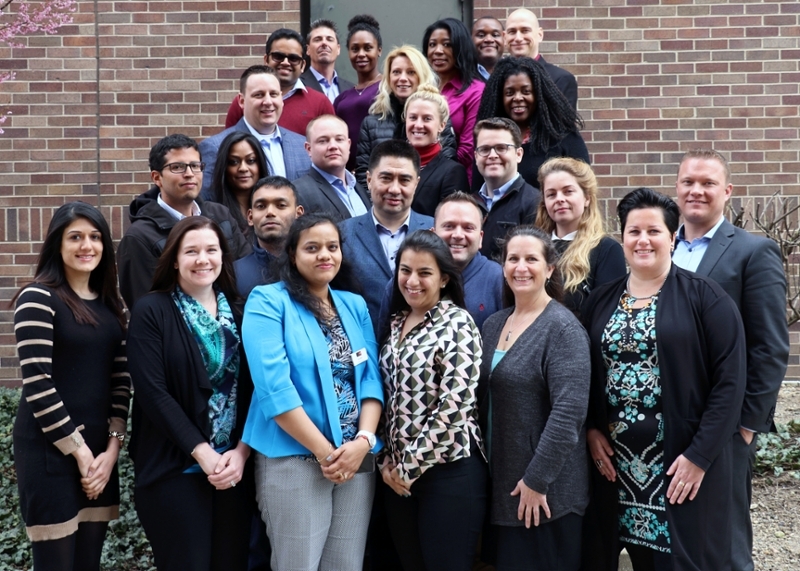 Our newest Executive MBA class launched September 14, 2015, and we're happy to welcome this diverse group that boasts accomplished professionals from Microsoft, Rolls Royce, Wabash National, Boeing, and Riley Hospital for Children at IU Health, among other companies. Also in the group are several entrepreneurs and members of the military. We look forward to a productive 19 months with our new class! Purdue EMBA Programs' Class of 2017 at Krannert Center during their launch week. Dr. Karthik Kannan, Associate Professor of Management at Krannert, hosted a free, interactive continuing education webinar on August 11, 2015, on the digitizing of the physical world. Presented by Krannert Executive Education Programs, "The Internet of Things: How Smart Objects will Transform our World," is archived and available for viewing. Devices with sensors and connectivity provide real time information about characteristics of physical objects, which can in turn be used to control other related physical objects. A sensor on your toothbrush can sense the whiteness of your teeth and provide feedback on your brushing habits. Cisco expects about 25 billion interconnected things to be employed by 2020. A recent report by McKinsey estimates the economic impact of IoT based applications to be at least $4 trillion by 2025. As part of our Continuing Education Webinar Series, Krannert Executive Education Programs presents biannual webinars on research and business topics. Follow us on LinkedIn to stay up to date on these offerings, and send an email to krannertexec@purdue.edu to receive email invitations to our webinars. The world’s most global executive MBA program just got more global. 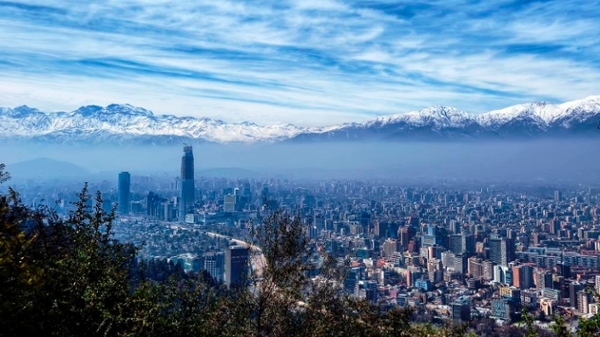 The IMM Global EMBA program is expanding its cultural immersion and academic offerings by holding its first residency in Santiago, Chile, in October 2015. The IMM Class of 2016 will study on the University of Chile campus for a portion of the cohort’s second of five residencies. Santiago is Chile’s capital and largest city. It is in a valley surrounded by the snow-capped Andes and the Chilean Coastal Range. The IMM program is administered by five renowned universities: Purdue University’s Krannert School of Management in the U.S.; TIAS School for Business and Society, Tilburg, The Netherlands; Tianjin University, Tianjin, China; Central European University, Budapest, Hungary; and FGV-EBAPE, Rio de Janeiro, Brazil. IMM students study in six countries – now seven with the addition of Chile – on four continents during the 19-month program. They earn two MBA degrees, one from Purdue and one from a European partner school of the students’ choosing. The Brazil residency will now become a South America residency, said Purdue’s Associate Dean for Executive Education David Schoorman, as students will spend one week at FGV-EBAPE in Rio and one week in Santiago. The contrast between Brazil and Chile makes for an ideal learning opportunity, Schoorman said. “Our IMM students will learn about doing business in disparate South American countries, each with their own unique resources and challenges. And our students will now experience immersion in both Spanish and Portuguese language and culture,” Schoorman said. The IMM Class of 2016 will tour two major headquarters of Chilean industry: the Concha y Toro winery and Codelco, the state-owned copper mining company. These company visits and industry cases complement the residency curriculum, which focuses on marketing and leadership. Purdue's EMBA Class of 2016, along with program alumni and corporate partners, welcomed Linda Clement-Holmes, CIO for Procter & Gamble and a Krannert alumna, to campus as a featured guest speaker on May 7, 2015. Clement-Holmes gave a presentation as part of Krannert Executive Education Programs' annual networking event. She also attended our reception in Krannert Center's Weiler Lounge. Clement-Holmes has worked all her life at P&G since graduating from Purdue, starting out as a systems analyst in 1983. Of particular interest were the "pivot-points" in her life that forced her out of her comfort zone and increased the breadth of her skills. Those pivot points helped her achieve much success and rise to her current position. She was named CIO in 2015. Clement-Holmes was a dynamic speaker. Watch her guest lecture here. 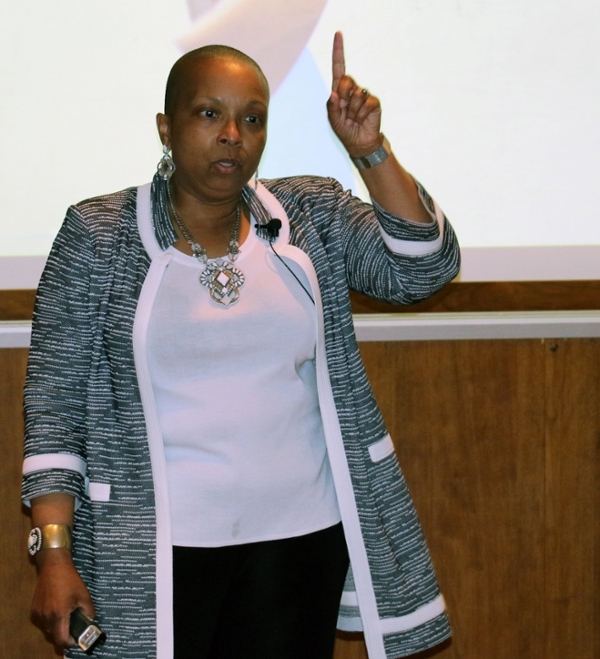 CIO of Procter & Gamble Linda Clement-Holmes makes a point during her guest lecture in Krannert Auditorium. 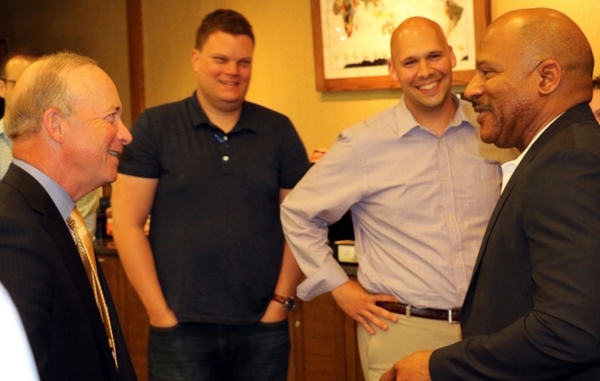 In what turned out to be a particularly event-filled residency, the EMBA Class of 2016 in early May got a visit from Purdue University President Mitch Daniels. Daniels visited our students after a day of classes in Krannert Center, to meet them and answer their questions about Purdue's future and priorities. The Q&A was followed by a reception in Weiler Lounge. It's part of our mission to bring leaders to our classrooms for the benefit of our executive students. Purdue President Mitch Daniels speaks to EMBA 2016 students in Krannert Center on May 6, 2015. The IMM Global EMBA Class of 2016 launched March 29, 2015, with a week of introductions, prep work and class sessions at Purdue. We welcome this talented, diverse group of professionals. Four members of this new class are U.S. military veterans. Twenty percent of the class is female. The average amount of work experience across the cohort is more than 16 years. Industries represented include manufacturing, construction and heathcare. These students hail from across the U.S. and four foreign countries: Hungary, The Netherlands, Nigeria, and South Korea. We look forward to a rewarding 19 months -- and beyond. The IMM Global EMBA Class of 2016 poses for the first of many group shots, at Purdue's Krannert Center during launch week. Krannert Executive Education Programs' students are given even more global education opportunities than may be readily apparent. 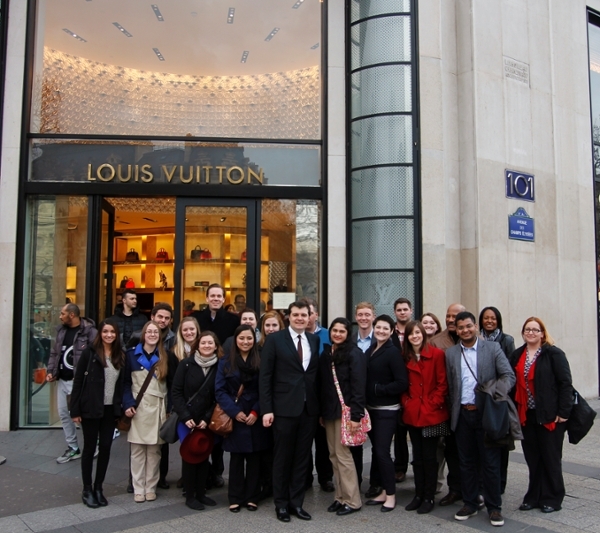 In March 2015, students in our EMBA classes of 2015 and 2016 traveled to Paris with Krannert's full-time MBA students for a week-long study abroad trip that focused on international marketing. Classes were held at ESCP Europe, the world's oldest business school with five urban campuses in Paris, London, Berlin, Madrid, and Torino. Topics covered included managing cultural diversity, intercultural communication, and international product and brand management. The students toured Paris at night, visited Reims and the Mumm Champagne House, and took a boat ride on the Seine. Krannert Executive Education students and Krannert School of Management full-time MBA students studied and enjoyed Parisian culture together. These full-time MBA study abroad trips are not part of the standard EMBA curriculum, but are open to executive education students able to go -- and to our program alumni. Also on the Paris trip was IMM Global EMBA Class of 2014 alum Hendrik Leder. Educational and social engagement with our students doesn't end when they have earned their degree. Find a gallery of Hendrik's Paris images on the IMM Global EMBA Facebook page. Paul Ryder, a 1994 Exec Ed alum and Amazon’s vice president of media and student programs, visited Purdue's campus February 3, 2015, to help launch the Purdue Student Store on Amazon. This collaboration is the first of its kind. Read more about Amazon's first campus pickup location and see a video story of the ribbon-cutting ceremony. 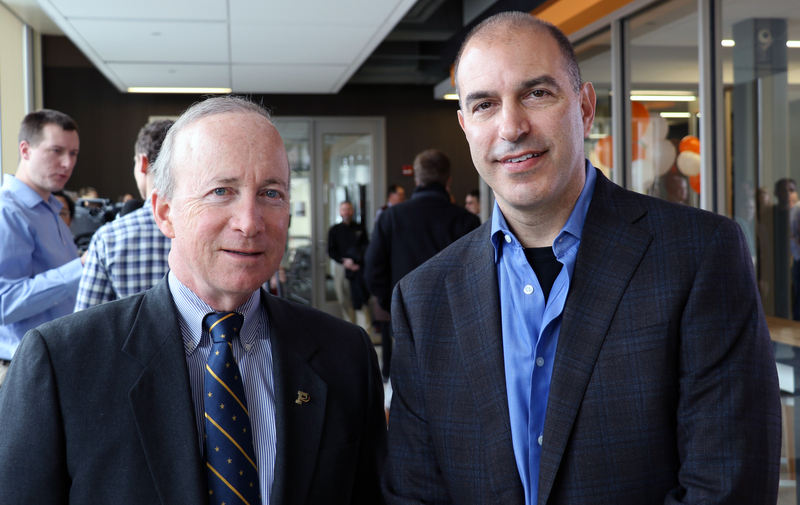 Purdue University President Mitch Daniels and Krannert Executive Education Programs alumnus Paul Ryder, right, opened the new Amazon location on Purdue's campus, in the Krach Leadership Center. One of our four IMM Global EMBA partner schools, the Brazilian School of Public and Business Administration (FGV/EBAPE), has been ranked as the best School of Administration for the second year running by the Ministry of Education. FGV's School of Administration is also among the top three institutions of higher education in Brazil, alongside FGV’s two Schools of Economics, in São Paulo and in Rio de Janeiro. Read more about this repeat distinction. The IMM Global EMBA program is led by five renowned business schools, working together to provide a unique global learning experience. We congratulate our IMM Global EMBA Class of 2014 upon their graduation on December 21, 2014. Students graduated with two MBA degrees -- one from Purdue University and one from an overseas partner school, either TIAS School for Business and Society in the Netherlands or Central European University in Hungary. Twenty-one students graduated in the Class of 2014, with 19 traveling back to West Lafayette with friends and family members to take part in graduation festivities. Members of IMM 2014 prep for graduation in Krannert Center's Weiler Lounge, where they spent so much time as students. Four students, Sebastian Ahrens, Job Hoevenaars, Hendrik Leder and Richard Csuri, were named Beta Gamma (top 20% of their class) and Ahrens was honored for having the highest GPA in the cohort. Faculty awards went to Thomas Eppel (Outstanding Professor) and Filip Caeldries (Excellence in Teaching). Our graduates are set for further success, and we wish them well as we look forward to welcoming the IMM Class of 2016 in March. 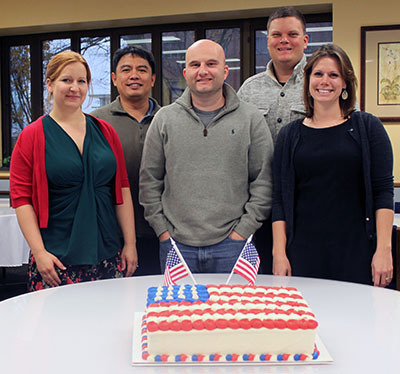 On Veterans Day, November 11, 2014, we honored our student-veterans and active military in the EMBA Class of 2016, on the Purdue campus for their residency. The Exec Ed team and the students of EMBA 2016 gave a round of applause to, from left to right, first row: Courtney Mills, Matt Guest and Casey Jackson; and in the second row: Cliff Lopez and Kyle Hackbarth. Krannert Executive Education Programs appreciates our veterans! 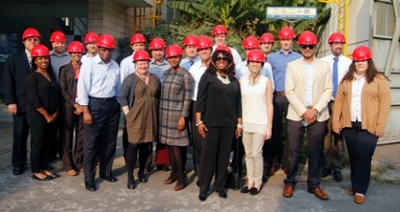 IMM Global Executive MBA 2014 students toured Bao Steel, one of the largest steel companies in the world, during their October 2014 residency in China. Their residency also included meeting with guest speaker Leigh Gui, CFO of eBay for Greater China; an alumni reception; tours of Shanghai, the Great Wall of China, the Forbidden City and Tiananmen Square; and courses in Global Strategy, Change Management, Geocompetitive Perspectives and more. IMM students also benefited from a presentation by Purdue alumnus and AAM (formerly known as American Axle Manufacturing) plant manager Greg Donofrio, who provided an overview of the company's operations in Shanghai, and from interactions with partner school Tianjin University faculty, staff and students. Congratulations to the Executive MBA Class of 2014 on their graduation in May. 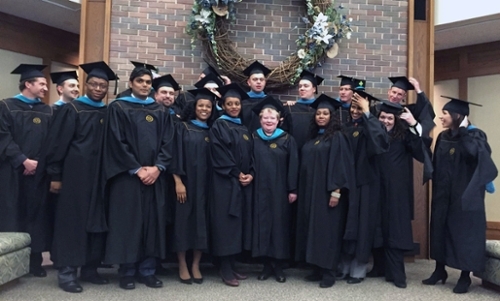 Nineteen of the cohort's 22 students participated in commencement exercises. The Krannert School of Management, including the Executive MBA and the IMM Global MBA programs, was recently approved for EQUIS accreditation (one of only a handful of U.S. schools) for a three-year term, the maximum length for a first-time approval. This accreditation comes from the European Foundation for Management Development (EFMD) and along with AACSB accreditation represent the highest standards of excellence for a business school. More information about this achievement can be found at www.efmd.org. Read about alumni accomplishments, program developments, research and more in our newsletter, The Purdue Executive. Stay up-to-date with Krannert Executive Education Programs on LinkedIn. For four straight years, a Purdue Executive MBA Programs' alum has made Poets & Quants' annual list of the Best & Brightest EMBA students. Hear from these Best and Brightest as Courtney Metzger, EMBA 2017, Jennifer Harms, IMM 2015, and Saskia de Bruin, IMM 2017 give their take on the Executive MBA programs and the benefits of networking with their cohort. IMM Class of 2015 alumni Michael Brandt, Michael Dow, Luis Escorcia and Alex Parilli are now, a few years after graduation, working together. They met in their IMM program, formed strong professional and personal bonds, kept in touch, and now are supply chain professionals at the same company in southern California. In this panel discussion, hear their take on the power of the Purdue network and the benefits of earning your Executive MBA in our global program. Become an executive education student for a day during our EMBA Experience. Get information about our upcoming on-campus EMBA Experience open houses and register here. Can't make it to West Lafayette for an open house? Join us virtually! Learn more about our Virtual Visits. We come to you for a one-on-one meeting to discuss your goals and how an EMBA from Purdue can help. Chat with Executive Director Aldas Kriauciunas and a current student or an alumnus and learn about Purdue's two Executive MBA programs during our live webinars. See a list of upcoming webinars.